Yes, that is snow in the background. We are finally having the our first measurable snowfall in Chicago. Yesterday it was 50 degrees. I had decided that I would make the Lemon Lime Poppy Seed Muffins yesterday, when it was balmy. When I woke up this morning, it was snowing, and has been snowing all day. C'est la vie. I found this recipe from Annie's Eats for Lemon Poppy Seed Muffins. My hubby loves anything lemon, and he also likes lime, so I added the juice and zest of a lime as well as a lemon juice and zest. Of course I also added my favorite Greek yogurt, which made the muffins moist and tasty. Then I gave them a snow cap of lemon lime glaze, which gives the muffins another layer of flavor. So even though we are in the throws of a winter storm, you can munch on one of these muffins and think of warm, Spring days. I did make a Lemon Lime Poppy Seed Snowflake muffin to commemorate the first snow! Happy Snow shoveling! Preheat the oven to 350˚ F. Line a muffin pan with paper liners, or spray muffin tin cups with cooking spray. Combine the flour, poppy seeds, baking powder, baking soda and salt in a medium bowl. Stir briefly to combine. In a mixing bowl, beat together the butter and sugar on medium-high speed until light and fluffy, about 2 minutes. Beat in the eggs one at a time, blending well after each addition. Mix in the lemon zest and juice and lime zest and juice. With the mixer on low speed, mix in the dry ingredients in two additions alternating with the yogurt, beating each addition just until incorporated. Divide the batter between the prepared liners, filling each about two-thirds full. Bake 18-20 minutes, until a toothpick inserted in the center comes out clean. Then transfer to a wire rack to cool completely, so the bottoms don’t get soggy. While the muffins are still warm, whisk together the confectioners’ sugar and lemon juice and lime juice, in a small bowl to make the glaze. Drizzle a small amount of the glaze over each muffin. Let the glaze set before serving. January is #citruslovemonth month. Please join in on the #citruslove by linking up any citrus recipe from the month of January 2012. Poppy seeds and citrus are a great combination! Like you, I see no need to restrict citrus flavors to summertime, but the thought naturally goes directly to that season. These do look like a welcome treat for the breakfast table. It has been so long since we have had a snowfall here. The weather usually decides to be icy instead. Enjoy your winter wonderland! 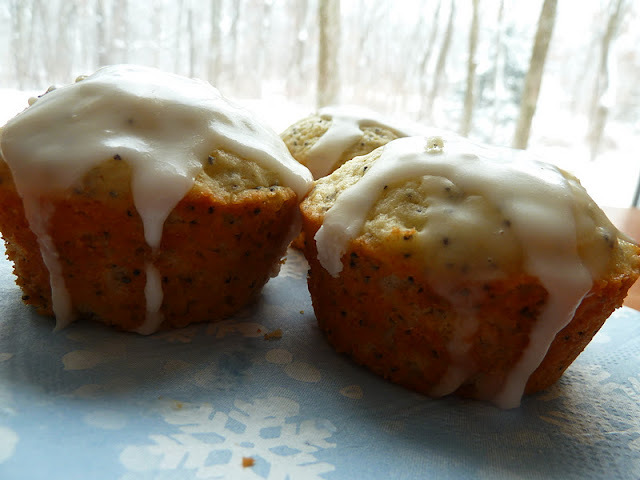 Tina- I was just going to make Lemon Poppy Seed muffins, but decided to add the lime at the last minute, so I wasn't thinking about the weather, until it did start snowing. Oh, my daughter would go nuts for these!!! She loves poppy seed muffins. Yours will be on my baking list for sure :) We only got a bit of your snow...but it's the COLD I'm complaining about! Thanks for joining the citruslove blog hop! Lizzy- Hope that your daughter likes these muffins. It's cold and snowy here, a double whammy, but we have been so spoiled this winter. Blog hops are fun, and you get to meet a lot of new bloggers. OMG-Becky! 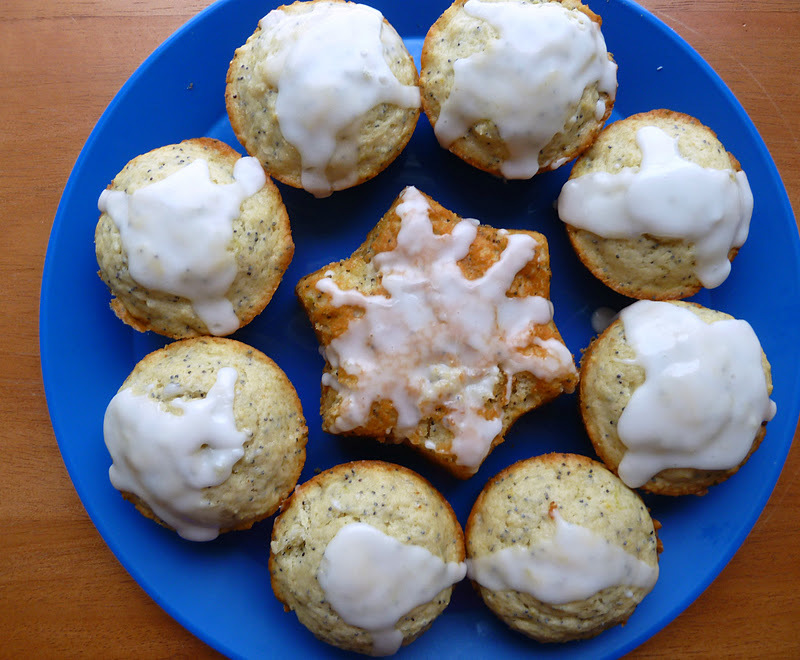 I love these amazing lemon poppyseed muffins with the gorgeous glaze you made! I went to the "source" and printed it out to want to make this ASAP. Wow, just look at all the bloggers participating in the #citruslove! Elisabeth- Thank you for your sweet words. #citruslove has a good turnout this month:) Let me know how you like the muffins. Hi Becky-Just wanted to let you know, I have an award waiting for you to pick up on my blog. Congratulations, well deserved! Elisabeth- thank you so much for the inspirational Blog award. award. I will be passing this on soon. These look scrumptious!Love the pics as well!